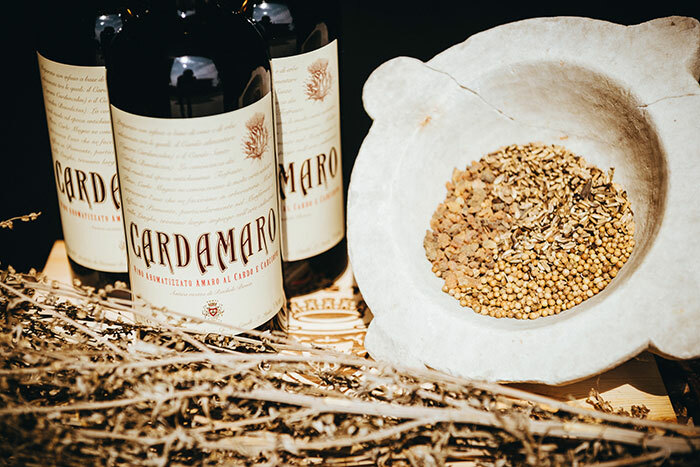 The one and only amaro based on wine and Nizza Monferrato Cardoon. Recreate from the ancient recipe of Bosca’s herbalist wineblender this bitter tonic liquer has countless health-giving properties taken from the cardoon. With its pleasantly bitter taste it’s perfect to side any occasion particularly after a good meal. 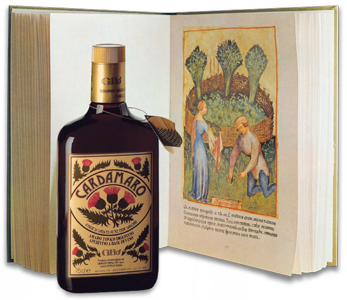 Cardamaro is prepared by wine base infusion of Nizza Monferrato cardoon (Cynara Cardunculus var altilis), blessed cardoon (Cardus Benedictus), milk cardoon (Sylbym Marianum) and other selected herbs such as calumba, juniper, Gentiana Lutea berries, cloves, liquorice root, cardamom, lemon peel and marjoram cultivated in Piedmont. Rachele Torlasco Bosca, an distinguished member of the Bosca family, a scholar and connoisseur of the beneficial qualities of many wild plants, spent her life in the search of the perfect product based on herbs, which contained the quality to invigorate the body and spirit. It is said that in the 50’s, during a dinner, she was particularly impressed by the tales on the extraordinary benefits towards liver stimulation and digestion of Nizza Monferrato cardoon. The day after she began her studies to create a recipe based on this vegetable, with alcohol maceration together with some herbs. Over the following years, Bosca’s herbalists have refined the recipe, integrating it with the constant addition of medicinal herbs and with the intent of finding the perfect recipe. 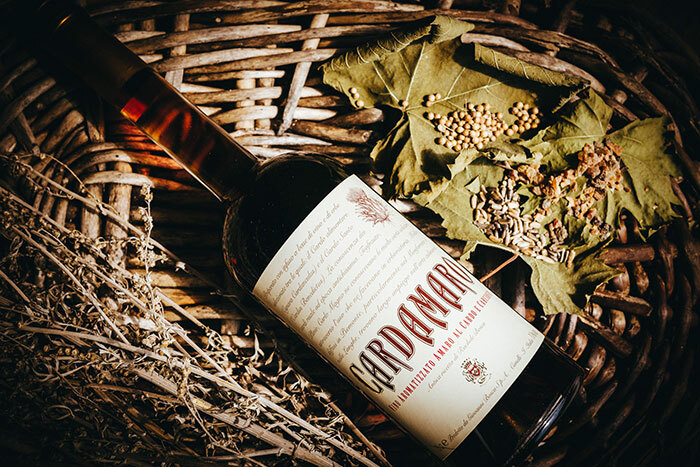 The final formula was defined when it was discovered that the cardoon and 23 other herbs, expertly dosed through a secret recipe, when handled through a wine-based process would lead to the best compendium: this was the genesis Cardamaro, the Wine Bitter, the only bitter based on cardoon. The color is reddish-yellow, almost amber, with bright tinges and dark brown hints with transparency. On the nose it is strong and complex, thanks to the blend of the various extracts and the long ageing process. Spicy notes of Hunchback Cardoon, Gentiana, clary sage and liquorice are prominent; hints of dried fruit, grapes and ginger also emerge. The taste is sweet, full and well-orchestrated flavour reflecting the extraordinary balance between the sweet note, the bitter quality of some of the officinal herbs and the pleasant tastiness of the wine. The tasting experience is unique, with pleasantness unmatched by any other amaro, thanks to the moderate alcohol content. The long-lasting aftertaste retains the complexity and spicy notes of the herbs, with a slight hint of tobacco. Among the three cardoon used the protagonist is undoubtedly Nizza Monferrato hunchback Cardoon, a slow food presidium, a precious jewel of Monferrato territory. It is a winter vegetable similar to celery, but belonging to the family of artichokes. Even the taste is similar to that of the artichoke, characteristic and bitterish but with nuances that resemble celery. 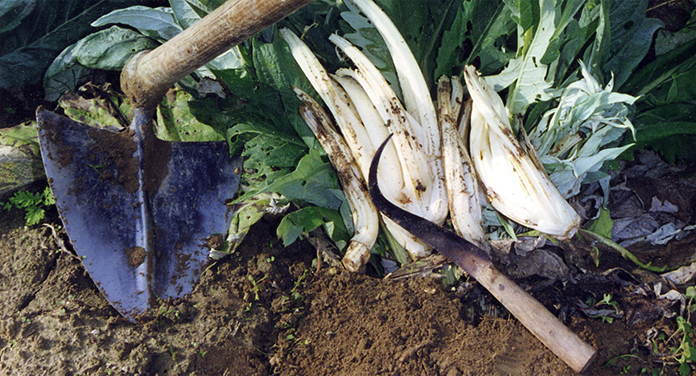 The Nizza Monferrato hunchback cardoon are not irrigated or fertilized. The cardoons become “hunchbacks” thanks to an unusual cultivation technique. In September the tall, bushy plants are folded and covered with earth. As they try to free themselves and reach the light, they swell and curve. The stems lose all their chlorophyll, becoming white and tender. After a month they are uncovered and the leaves and any damaged parts are cut off, leaving the crisp, sweet heart. Protects the liver: thistle is known mainly for having protective properties for the liver due to a mixture of flavonolignans present in its achenes and called silymarin. This blend has excellent purifying and protective qualities for the liver. It is often used in cases of poisoning caused by alcohol, hepatitis, drugs. Silymarin is used against extremely dangerous mushroom such as Amanita Phalloides. Milk thistle has been approved in the US since 1986 as a treatment for liver disease and is widely used for alcoholic hepatitis, cirrhosis and viral hepatitis. Anti-inflammatory: this plant is beneficial to the kidneys, it fights the intestinal inflammation and is also used to treat psoriasis. Antioxidants: this vegetable also has antioxidant properties and its intake to allow you to control the activity of free radicals, thus limiting the damage to our body. When taken as tea counteracts the onset of PMS migraine. Galattogene properties: Thanks to its qualities is often prescribed to new mothers as it stimulates the production of breast milk. Stress: for its tonic and decongestant properties is also a great help in case of stress, fatigue and depression. Gallbladder stones: taken in the mother tincture form comes in handy in case of gallbladder stones. Used in chemotherapy: in more recent times, thanks to its properties and its qualities for the liver, its extracts are administered to patients who are undergoing chemotherapy to limit liver damage. Cancer: preliminary studies in the laboratory suggest that silymarin has strong antioxidant properties and is able to inhibit the growth of certain types of cancer such as prostate and breast. However, further studies to confirm of what suggested by preliminary studies are needed. In addition to milk thistle and the Cardo Gobbo (Hunchback) there are other varieties: the Giant of Verona, Riccio d’Asti, Chieri and Bolognese. The most valuable variety is considered the one of Nizza Monferrato, the Cardo Gobbo, characterized by the typical curvature of the stem due to the type of cultivation to which the thistle is subjected. In late autumn, the vegetable is lying down and partially buried so that the plant in an effort to seek the light, take the typical curvature. Thanks to this treatment, the plant is able to survive the winter in an optimal way and its stem assumes a white color and becomes tender. The Milk thistle and the Gobbo (Hunchback) are the ingredients of a typical Piedmont dish: bagna càuda. Milk Thistle takes its name from a legend that tells how Joseph and Mary, fleeing from Herod’s soldiers, hid themselves among thistles. Mary’s milk stained the plants. Hence the name of the vegetable. It contains tannins, substances with astringent properties that brings significant benefits in case of hemorrhoids and wounds as they favor the repair of damaged tissues. To calm the fever you can take a couple of cups a day of leaf tea. As a healing using the seeds powder to sprinkle directly on the wounds. The infusion is a useful remedy in the event of low blood pressure; for this reason, those who have high blood pressure should use caution in consuming the thistle. The thistle extracts, if taken excessively, can be laxative. 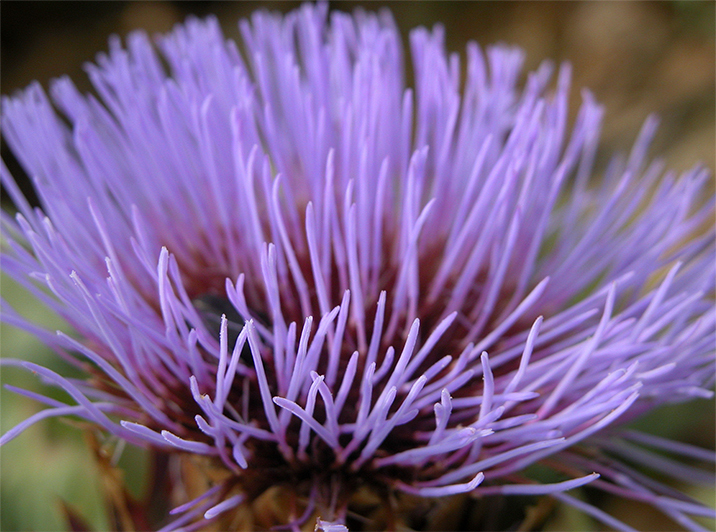 Thistle contains about 94% water, 1.7% sugar, 0.6% protein, 1.5% of dietary fiber and 0.1% fat. Minerals: potassium in good quantity, iron, copper, sodium, magnesium, zinc, manganese, calcium and phosphorus. Vitamins: B1, B2, B5, B6 and C are all present. Each 100 grams of edible portion provide a caloric intake equal to 17 calories. Peel the gloves and eliminate the central green root. Boild the gloves in the milk 15 minutes until soft. Squeez soflty to obtain a cream. Transfer garlic cream to heavy medium saucepan, add anchovy and oil and cook over low heat 15 minutes, stirring, occasionally. Pour sauce into fondue pot or other flameproof casserole. Set pot over alcohol burner or gas table burner to keep warm. Serve with Nizza Monferrato hunchback cardoon raw and vegetables. Clean and cut the cardoons into pieces, wash them in a basin with vinegar and water. Boil them in salted water until tender (about an hour and a half). In a saucepan mix the egg yolks, with 10 gr. of white flour, add the milk and blend until you get a mixture without lumps. Add fontina cheese previously cut into cubes and cook everything in a bain-marie until all the cheese is melted. In a saucepan melt a knob of butter, add olive oil and roast the cardoons. Add a but of Parmesan cheese and cook for 10 minutes. Place the cardoons in a dish and cover with fondue. Technique: build over ice in a double Old-Fashioned glass. Garnish with an orange peel. Technique: stir with ice and strain into a coupe. Garnish with an orange peel. Technique: place the sugar cube in a flute and douse with bitters. Add Cardamaro and Nux Alpina and stir briefly to combine. Top with sparkling wine and stir briefly to combine. Technique: stir with ice and strain into a coupe. Garnish with a lemon peel. Technique: build over ice in a Collins glass. Garnish with a wide long lemon peel. Technique: stir with ice and strain into a coupe. Technique: build over ice in a highball glass. Garnish with a lemon peel. frothy and pourable (like for a Irish coffee). Layer on top of drink in coupe. Sprinkle espresso powder on top. Technique: build in a highball glass with ice. Garnish with a grapefruit peel. Technique: shake with ice and double-strain into a coupe. Garnish with lemon peel.